Board of Secondary Education Madhya Bharat Gwalior (M.P.) is Registered Social Activates and Education Development by Govt. of India Planning Commission Yojana Bhawan New Delhi 110001. Which Registration No. MP/2011/00392229 and that Board Promoted by Whole India. The Board of Secondary Education Madhya Bharat Gwalior (M.P.) was inspired by the Govt. of India's Human Resources Development Minister Mr. Madhav Rao Sindhia. Who was introduced bill for first time? According to Govt. of India National Education Policy. 1986 Board of Secondary Education Madhya Bharat Gwalior (M.P.) is one of the best autonomous Board of India. According to the Ministry of Human Affairs. Govt. of India Notification No. 26/4/52 CC Dated. 20.09.1952 issued in consultation. with the union public service commission. That in the case of Degree /Diploma awarded by Board/University city in India. Which are in carporated by one act? of central of Part B state legislature in India. No formal orders reorganization such. Degree/ Diploma need be issued by Government. such Degree should be Recognized Automatically for the Purpose of employment. As per Statements on se. 2011 All India Achievers Foundation New Delhi is A Awarded Shiksha Bhartey Form Board of Secondary Education Madhya Bharat Gwalior (M.P.) thatfondation gave the membership in this Board. Regarding the equblancy letter of High School Examination run by Board of Secondary Education Madhya Bharat Gwalior (M.P.) is awarded by Board of Secondary Education Allahabad (U.P.) As per the Educational manual Para 14 of clause 2 (40). As per the letter No. 9090/20/0111 Dated 04.10.2010 the U.P. Board of Sanskrit Education Lucknow U.P. High School Passing Students with 45% marks from Board of Secondary Education Madhya Bharat Gwalior (M.P.) is eligible to get admission in class of UttarMadhyma. Equblancy with Jamia Urdu (Aligarh) vide Reference No. 786/JUA/2010 Dated, 17.09.2010 Jamia Urdu Aligarh recognized All Course of Board of Secondary Education Madhya Bharat Gwalior (M.P.) for High Education and Research work and forwarded the copies to Chairman Minority Commission New Delhi. Project Co-ordinatior (Minority cell) Mohorat institute of Opining Schooling Noida. As per Advertisements no. 40/2005 Dates 25.07.2005 the Board Higher Secondary Education Patna (Bihar) which Board is awarded regarding equblancy letter from central Government/ State Government equblancy of inter mediate examination. As per letter No. CPID/600/2010 Date on 03.09.2010 Vishwa Bharti Shanti Niketan West Bengal. Intermediate (10+2) passing student from Board of Secondary Education Madhya Bharat Gwalior (M.P.) 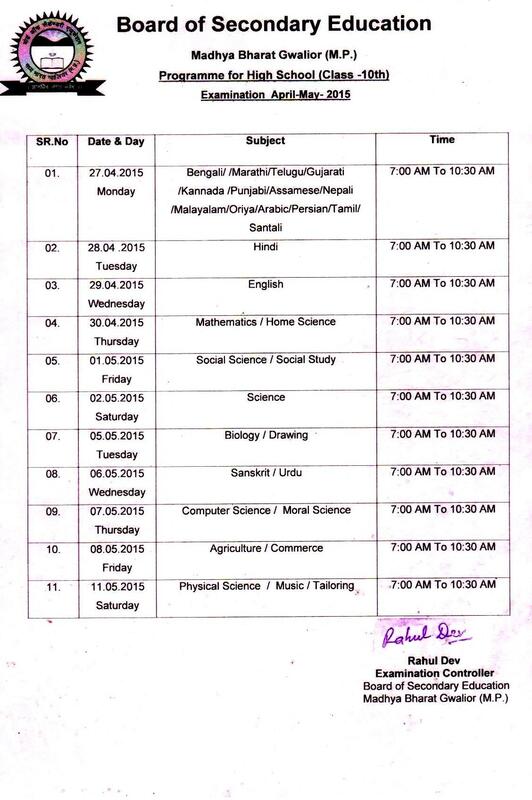 to get admission in class of pre degree examination. As per Advertisements no.KITM/1036/273/10 Dated 21.08.2010 Krishna Institute of Technology and management Mathura. intermediate (10+2) passing students from Board of Secondary Education Madhya Bharat Gwalior (M.P.) is legible to get Admission in class B.A.,BCA, B.Tech, B.Farma, Hotel Management which institute is awarded IASE University Sardar Nagar Rajasthan. As per letter No. MCA/URO828/15159/2010 Dated 28.08.2010 Mahirish Dyanand College of Vedik Astrology Udaipur Rajasthan. High School (10th ) and intermediate (10+2) passing students from Board of Secondary Education Madhya Bharat Gwalior (M.P.) is grant to get Admission correspondence course. As per letter No. 5524/3 Dated 31.02.2010 Hindi Sahitya Sammalan Allahabad (U.P.) High School (10th) and intermediate (10+2) passing students form Board of Secondary Education Madhya Bharat Gwalior (M.P.) is grant to get Admission class of Madhyma First Year and Uttma First Year. As per letter No. Zero/Dated 30.05.2010 Dr. MPS Group of Business Studies Agra. Intermediate (10+2) passing student from Board of Secondary Education Madhya Bharat Gwalior (M.P.) is elegeble to get admission in class B.B.A. and B.C.A. whose college isawarded by Dr. B.R. Amedkar University Agra (U.P.). As per letter No. Zero/Dated 21.05.2010 School of Abision Science and Technology Flaying club Delhi Intermediate (10+2) passing student. from Board of Secondary Education Madhya Bharat Gwalior (M.P.) is eligible to get admission Basic Air Craft Maintenance EngineerCertificate (BACMEC). 20. As per statement No. Zero/Dated 18.11.2010 international Maretime Academy 41 Jamin Karottur Pudhuchataram Chennai. intermediate (10+2) passing students form Board of Secondary Education Madhya Bharat Gwalior (M.P.) is eligible to gate admission in Diploma NEAUTICAL SCIENCE course in first year. whose Academy approved by D.G. Shipping Govt. of India. As per Advertisement Chapter No. XI Regulation Kerala University intermediate (10+2) passing student from Board of Secondary Education Madhya Bharat Gwalior (M.P.) is eligible to get Admission in class pre degree examination. As per letter No. URO/JPR2010/65 Date 06.05.2010 Jyoti Vidhya Peeth Women University Jaypur. intermediate (10+2) passing students from Board of Secondary Education Madhya Bharat Gwalior (M.P.) is eleglible to get admission in class pre degree examination. As per letter No. D.P.O./465/C.G./ on Dated 28.02.2011 Regional manager Northern Railway Moradabad (U.P.) High School (10th) passing Students from Board of Secondary Education Madhya Bharat Gwalior (M.P.) is eligible appointment Railway Board. 24. As per letter No. 038/CHO/Dero/Pro/Marksheet Verification/2010-2011 of Dated 31.07.2010 Child Development Project officer Banda Shahjhanpur (U.P.) High School (10th) and Inter Mediate (10+2) Passing Student from Board of Secondary Education Madhya Bharat Gwalior (M.P.) is grant to eligible to get apartment these Projects.